How to do dynamic dependent select box using Jquery, Ajax, PHP and Mysql. Dependent select box when a selection is made in a "Parent" box it allow to refresh a "child" box list data. In this post I had given a database relationship example betweent "catergory" and "subcategory". It's very simple jquery code hope you like this. Sample database tables. Data table contains list boxes complete data, data_parent table foreign key relationship with Data table contains parent and child relation. If you can't code this up yourself in 10 minutes, it's time to get a new job that doesn't involve programming. Quite bad practice, you should really have 2 tables, a cities table with a country_id field and a countries table and use JOIN's to get the correct data. anyone know how to make this 5 level ???? Hi, Nice Worked But How To add chainde for city ( 3 levels ) State ? I have specific value for 'pid' and 'did' in the database. For example, the edit product page. How can I make it auto select the specific 'pid' and 'did' that load from the database when the page is newly loaded? How can I call this function with body onload for specific value of 'pid' and 'did'? Awesome, best I've found in my searches. Fantastic. Exactly what I needed to learn. Thank you. awesome..ur site make my job easy..thanks dude..
After sending the form, I can recover and select the country value, but not the city. How can I load the city options and then select it the submitted value after sending the form? Wow., it's very useful!! Thanks bro.. I want to use a textfield instead of select! So I am trying to incorporate this into WordPress using categories as dropdown menus. I have the original menu being generated through the Wordpress function "wp_dropdown_categories" with a few variables (such as class, depth, etc) to make it only display the highest most categories. Anyways it's not working. I have it call ajaxcats.php which checks for an id, then it renders the "wp_dropdown_categories" with the "child_of" category being the value that was passed. Sorry if it is difficult to understand. I can send you the code if you want. Thanks mate, Very useful. Converted it to ASP/Access and 3 levels. Thanks. i dont get this part which id point that id of database ? Thank you for sharing. I need this script. what about the load() function. isnt it esier to use it? I just have a problem. I'm using a form with styles, and when the select is replaced by ajax by a new select, it loses all the styles. Do you know how to apply again the styles to this select? when we choose one country in select box then appeared related cities , ok fine.. but again if we choose 'select-country' item in first select box then all country list display in second select box .it is voilated. Please verify once and reply it. Thanks... really helpful.. that's what i need to do now. I can insert the record into the database. But i have a problem.. how to edit the record (dependent list box)? please show me some example. Very urgent. i downloaded the code and it was very useful but is it possible to provide another selection box in which we can provide cities also, currently it is country and states. So can one help me out. How do I add a submit button and direct the selected City for example to a separate City page? we have a sql query as below. why there is "b" & "a" is used and what is the purpose of it? it is not defined any where? This is just madness, Brilliant work man !!! And towards those commenter who said that the same thing could be done in another way, "This is just a directive tutorial which Tamada has posted to let Programmers have a concept without wasting their time by creating a new one to do the similar thing. If you can't inspire, then just stopby. You will probably find free blogs to share your own Talent!!!". I usually read 9lessons, and i don't like people post such kind of worse reply without understanding the aim of the author. Good work. Could someone please post a solution to view 3 columns. - This is a brother from the Isles of Solomon. This is the one which I was looking for since a week. Could you please help me by implementing exact the same using JSon? Friends the script is perfect. however when I duplicate the campousando jquery, the fields do not carry duplicate data is wrong? Nice and simple script that did the job. And how can I set selected attribute if both select box have data read from database. Such as retrieve record for editing ? Can anyone help me modify the code so it works for like 10 forms on one page. I have a form with like 20 products and they have to be placed in main and subcategorie. I could use the script printing only one product and let someone put it in main and sub categorie, but as the script got like 2000 products I would like to have the option to present like 10 or 20 forms in wich products can be adjusted for price, name, main and sub categorie. Hope I explain properly so you know what I mean and you can help me out here. A very nice script! But how to deal with a selectbox with a multiple="multiple" tag? I know how to loop through a conventional $_POST['country'] array with different parents, but i don't know how to deal with an array in AJAX. Sorry, already found out! The (multiple) selected values are comma seperated. Another problem: When using a .htaccess file with Rewrite-rules, the complete HTML is written by the Ajax function into the selectbox! How to solve this? it works fine for me! anyone has the idea of how to disable the second combo box and enable it again after the first box is selected. how to three dropdown list like category->products->brand , how to get the value the dynamic and store the db , can u help me.. I have created the dropdown with the categories and subcategories, like in the example. But, how can I show the results in the content area of my site? Great script... But what happens when you need the VALUE of the select statement to return what the actual selection reads instead of the ID number, a VARCHAR? Any way to get the VALUE to be the same as the SELECTION? if i want to post two values to the file ajax_city.php then what to do? here only dataString is being posted. Please help. I need this but with 3 select boxes, can you help me? thanku very much, its very nice. If i want to save the Country and City name based on selection to another table what would be the code. Currently it is saving the ID no. thank you, very simple nice script. well done. I have a simple question, I have 2 options which i whant to be putted in the second dropdownbox, how to make them always shown? it works like charm for two select but it is not working with 3 select and another problem here is if someone select the fist one select like in select country if someone change back to select country the next select disappears please reply asap thanks in advance ! it works fine but in my opinion this task can be accomplished with one single table, data table to which we add a city column (which contains 0 for countries and the corresponding id of the country for each city ex. 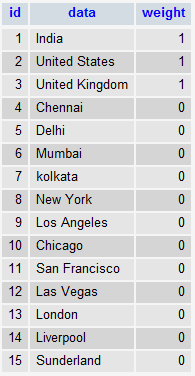 Delhi - 1, Los Angeles - 2 and so on) and we create a self joined relation in sql query. how to store this value in one onother table ?? i am clicking on first dropdown it showing content from database but not showing of second dropdown from database. how to create 3 dynamic select box with 3 different tables? its work ...but when we edit any post where we use both country and city ..
using json data implode in php we get city id through database. when i select india as country then all city related to india show in the city dropdown ,,,as when i choose uk or usa then their city is properly show in city dropdown...this is good,,,But problem is in this time when city drop down shows all city related to UK country .....if i change the dropdown value for uk and chose the option select country then city dropdown value changes..And it shows All country list in the city Dropdown main..
how Data show in input text field?